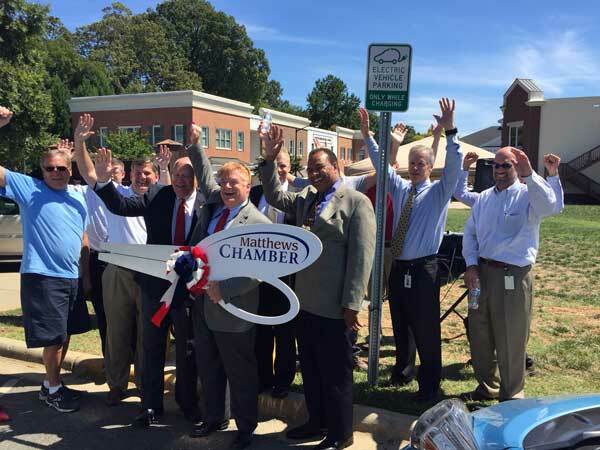 The Centralina Clean Fuels Coalition, in partnership with the Town of Matthews, hosted a ribbon cutting event for the new DC Fast Charger in Matthews, NC. Representative Bill Brawley, Mayor Jim Taylor, and Town Manager Hazen Blodgett were all in attendance. Representative Brawley and Mayor Taylor spoke about Matthews setting a precedence for chargers in the Greater Charlotte Region and how the charger would encourage more EVs and chargers. BMW and Nissan brought vehicles to display and show how the charger worked. It was a great event! Holding the big scissors is Mayor Jim Taylor. To his left is Representative Bill Brawley. To the right of the EV sign is Town Manager Hazen Blodgett. The Town of Matthews and the Centralina Clean Fuels Coalition are pleased to invite you to the grand opening of a new electric vehicle DC fast charger in downtown Matthews. Join us as we celebrate the continued growth of electric vehicle infrastructure in our area and to learn about the benefits that electric vehicles offer your community!